UFC Fight Night 119 Results: Derek Brunson Finishes Lyoto Machida TKO! Ultimate Fighting Championship (UFC) was back on television yesterday (Sat., Oct. 28 2017) with the UFC Fight Night 119 mixed martial arts (MMA) event on FOX Sports 1, which features a middleweight main event between Lyoto Machida and Derek Brunson, who battle for a spot in the 185-pound title chase. In the UFC Fight Night 119 co-main event, held inside Ibirapuera Gymnasium in Sao Paulo, Brazil, former welterweight No. 1 contender Demian Maia tries to quell the uprising of 170-pound rising star Colby Covington. Probably Machida may have been the legend in this bout, but the result shouldn’t be surprising. Brunson’s last six wins have come by first-round knockout or TKO. 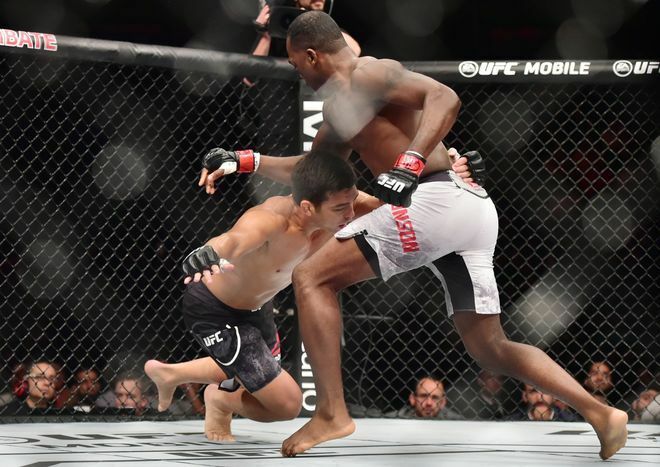 Two victories were snatched from his decision loss to Anderson Silva, Brunson utilized the opportunity to call out middleweight contender and former champion Luke Rockhold. After conservative loss to Silva two fights ago in February, probably it’s a good sign for the former Strikeforce competitor that he brought the aggression against a dangerous counterstriker in Machida. It was a promising start for “The Dragon,” who hadn’t fought in the octagon since June 2015, when he was knocked out by contender Yoel Romero. The fight with Brunson was his first since an 18-month suspension triggered by his admitted used of the banned 7-Keto-DHEA. In the bout, Lyoto Machida was the first to put his hands on Derek Brunson. Brunson looked a lot like old-school Machida because when he decided to strike, he did so with bad intentions. Seems like both men were tossing out low kicks. One minute in. Neither man landing any clean yet. Jab by Machida. Counter left lands for him. Brunson lunges in with a left, doesn’t connect. Machida just misses with another counter two minutes in. When Machida fired off a hook in counter to a lazy one Brunson threw, he followed up with a massive left hook that caught the Brazilian’s chin smashed. Machida’s legs went stumbling backward. The No. 7-ranked middleweight wasted no time in capitalizing. When his back hit the mat, Brunson met his chin again with a left hand and finish him off with some vicious ground-and-pound.It’s about to manage a well-timed punch. After the contest, a delighted Brunson, 18-5, said: “It feels good man, I got up for this fight. Lyoto is never going to lose his skills, he might lose his timing, speed and cardio but he’s never going to lose his skills.” The crowd was stunned and silent as Brunson celebrated with his corner before calling out his next opponent, Luke Rockhold. In addition it was a discouraging result for the former light heavyweight champion. Fans of The Dragon are used to seeing him time up opponents on the counter —not the other way around. While this might be an indication The Dragon is finished. At 39, so he is likely to face questions of retirement. Meanwhile, Brunson, 33, is firmly moving up the middleweight ladder. And in conclusion we can hope to see him as the next Middleweight Champion!